G. Rosul 51 Inch Pro Electric Sitar Fusion & Nylon Gig Bag. This G. Rosul electric fusion sitar is a hybrid instrument where classic and modern styles unite. 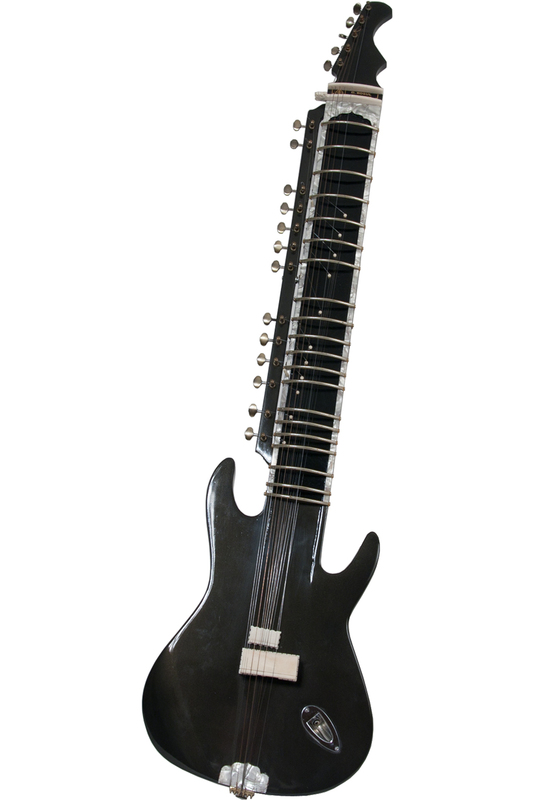 The general shape of sitar is similar to the modern electric guitar, but the neck, fret board and bridge are similar to the classic style of the Indian sitar. Instrument includes 11 sympathetic strings, 5 main strings and 2 chikari strings. It also has an internal pick-up and a female jack connector for an amplifier. Great sitar sound for any fusion band. Easier to transport to gigs than a traditional sitar. The top of the neck is outlined with a faux mother of pearl inlay. Please note: Decorations and colors will vary. These are all individually made and will be unique. Tuning Pegs/ Levers:There are 18 mechanical geared tuning pegs/levers with a 1:15 ratio.